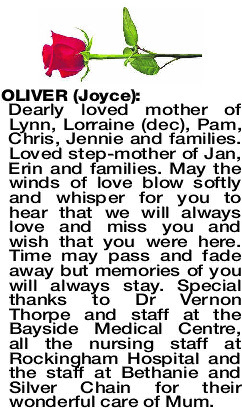 Dearly loved mother of Lynn, Lorraine (dec), Pam, Chris, Jennie and families. Loved step-mother of Jan, Erin and families. May the winds of love blow softly and whisper for you to hear that we will always love and miss you and wish that you were here. Time may pass and fade away but memories of you will always stay. Special thanks to Dr Vernon Thorpe and staff at the Bayside Medical Centre, all the nursing staff at Rockingham Hospital and the staff at Bethanie and Silver Chain for their wonderful care of Mum.